I don't know about you but one of my guilty pleasures is picking up an US Weekly or People and checking out what celebs are wearing, who they're are loving, and who has the best and worst bikini bodies. I love to know who has lost or gained weight and what they have done to get the best results. This curiosity stems from my never ending struggle with weight loss. 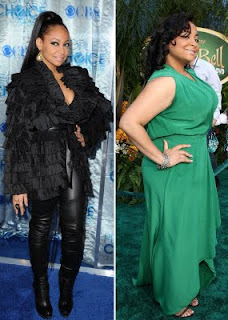 In the past couple of years, there has been an increasing pride in the world of the Curvy Girls but recently I have noticed that number of well known Curvy celebrities have been popping up out of hiding showing significant weight loss. 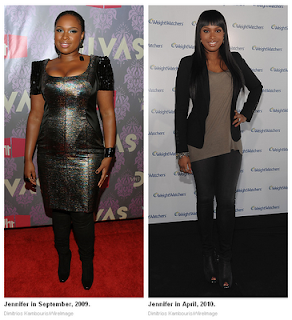 Jennifer Hudson down 80 pounds. I know it seems like celebrities have super powers that us average folks don't have but they don't. They are human just like us and struggle with discipline, cravings, and laziness just like we (I) do. There are so many weight loss pledges out there, why don't we just pledge to ourselves that we will keep our curves but just make them healthier so that we can live healthier, happier lives. I am about to add my name to this before and after list!!! ARE YOU??? P.S.- Check out this pic of Jordin Sparks Tweeted in her Bikini Body!!!! I am trying to get like this!! !